Every angler of a certain age remembers the How to Catch Them series, which launched thousands of hopeful anglers on a journey that most still have to complete. The series was launched by Herbert Jenkins and ran to 44 titles, all of which were based on the winningly simple formula of chucking out the fluff and boiling down the state of the art on a particular species or method into a hundred pages or less. The idea was a runaway success, helped by attractive design, keen pricing, liberal use of expert writers and a compact format that tucked neatly into pockets and just as often fell out again, which is why the originals are so collectible. Herbert Jenkins moved on to other things and the series was rapidly becoming a collector's item, when Medlar Press decided to revive the concept a few years ago, publishing the How to Catch Them Guide and a translation into English of the Gilthead Sea Bream volume, which previously had only been available in Spanish. Quite why Herbert Jenkins published the Gilthead book, I have no idea, but it is a tough one to find, nearly as rare as Cod. When Barrie Rickards heard about the new Medlar How to Catch Thems he was already terminally ill, but, irrepressible character he was, he sat down and wrote a new volume on zander for the series and this is the result. 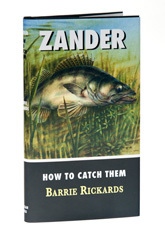 As I am sure the majority of readers are aware, Barrie was the British expert on the species, relying on experience dating back to the sixties - appropriately the last fish he caught was a zander - so this volume is the real McCoy and it is only sad that it had to be published after his death. Zander sticks closely to the original formula, right down to the way the horizontal white line on the cover doesn't line up with any of the other How to Catch Thems, which was half the charm of the series (how did Herbert Jenkins manage the amazing feat of getting the line so completely mismatched?). A lifetime of know-how is packed into eighty pages, Barrie having stuck so closely to the original format that it is hard to imagine that you aren't reading a new edition of one of the old series, just about the only departure being the inclusion of a rather fine section of black and white plates (Heretic! Burn him!) my favourite being the one of Barrie's record zander temporarily accommodated in his bath. Just about the only criticism I would make of the book is that the typeface is pretty small and if you are an angler of a certain age, you will need your seeing-eye dog glasses to read it. This is just about a compulsory purchase if you are a zander fisherman, but collectors of How to Catch Thems should take note, because if anything proves that Herbert Jenkins got the formula right all those years ago, Barrie Rickards' Zander is surely it.